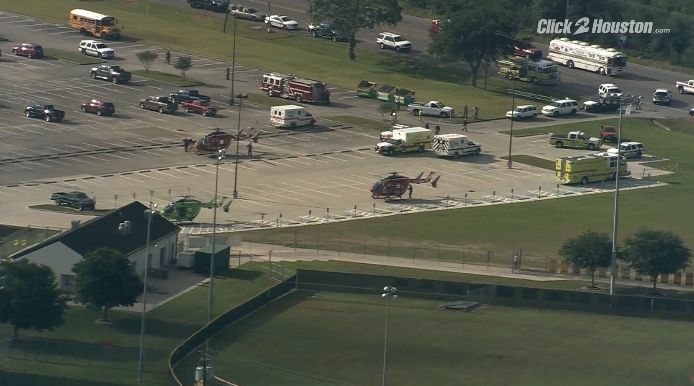 SANTA FE, Texas (Click 2 Houston) — Ten people were killed Friday in a shooting at Santa Fe High School, according to NBC News, and police are investigating explosive devices found at the scene and nearby. Harris County Sheriff Ed Gonzalez said a majority of those that were killed in the shooting were students. He said that the two people who were taken into custody, including the person believed to be the gunman, are students at the school. Gonzalez said a Santa Fe Independent School District police officer was critically injured in the shooting. Officials at UTMB Hospital in Galveston said the facility had received at least three patients from the scene, including the Santa Fe ISD police officer, a 16-year-old boy and a middle-aged woman. The officer is listed in critical condition. The two others suffered gunshot wounds to the leg and are listed in good condition.